Duratron® D7000 PI is an exceptional value for applications where thermal requirements exclude Duratron PAI and do not require the extraordinary thermal resistance of Duratron PBI. Duratron PI is available in several grades for structural and wear applications and in the broadest range of shapes - particularly thick sheets, larger sheets geometries and heavy-wall tubes. 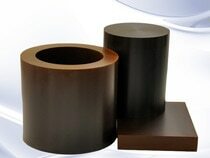 It offers good mechanical performance for applications that demand higher temperature resistance. Duratron® D7000 PI machinable shapes are ideal starting points for designs that reduce weight, extend length of service before maintenance or replacement and reduce overall cost by increasing process uptime. Duratron PI materials are just one of the solutions in the machinable plastics industry's broadest product line.